英文摘要：The concrete outer tank of a full-containment LNG storage tank consists of circular bottom slab, cylindrical wall and dome roof, and is a statically indeterminate structure. When the finite element analysis is used for the outer concrete tank, the geometric dimensions of the tank should be determined at first and the rationality of these values will affect the efficiency of the analysis. By analyzing the property of the outer tank under the major loads which will control the section design, and taking the requirements of strength and service and load factors under different design limited states into account, the formulas of calculating the roof thickness, haunch thickness and wall thickness are deduced in this paper. 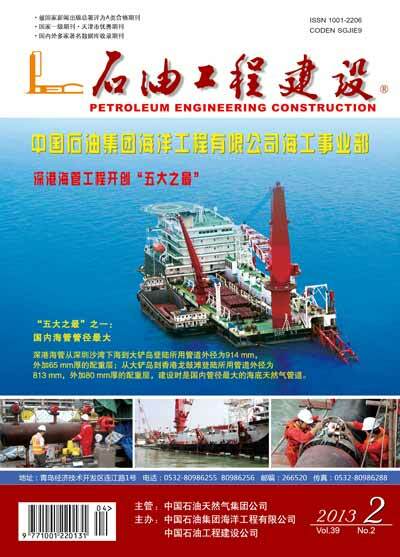 The research results have been applied to the designs of Jiangsu and Dalian LNG projects and proved to be correct. EN 14620-5-2006,Design and manufacture of site built,vertical,cylindrical,flat-bottomed steel tanks for the storage of refrigerated,liquefied gases with operating temperatures between 0 ℃ and-165℃-Part 5:Testing,drying,purging and cool-down[S]. BS 7777-3-1993,Flat-bottomed,vertical,cylindrical storage tanks for low temperature service Part 3.Recommendations for the design and construction of prestressed and reinforced concrete tanks and tank foundations,and for the design and installation of tank insulation,tank liners and tank coatings[S]. EN 14620-3-2006,Design and manufacture of site built,vertical,cylindrical,flat-bottomed steel tanks for the storage of refrigerated,liquefied gases with operating temperatures between 0℃ and-165℃-Part 3:Concrete Components[S]. Comite Euro-international Du Beton CEB-FIP model code 1990:Design Code[M].London:Thomas Telford,1993. EN 1992-1-1-2004,Eurocode 2:Design of concrete structures-Part 1-1:General rules and rules for buildings[S].